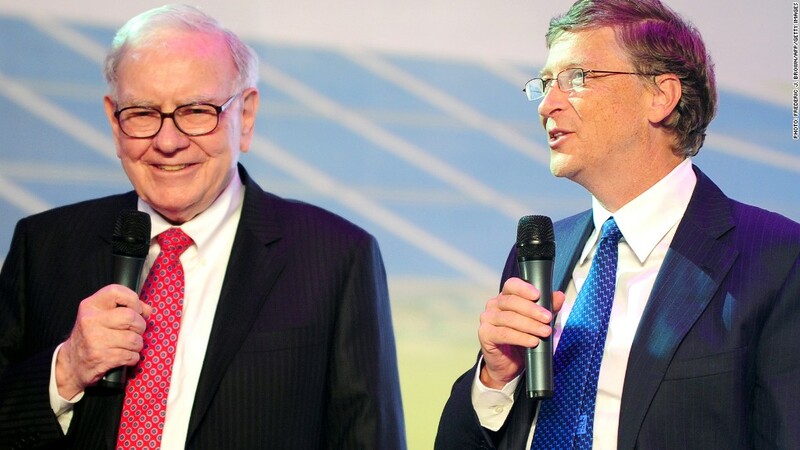 Warren Buffett, left, donated $2 billion in Berkshire Hathaway stock to the foundation co-founded by Microsoft chairman Bill Gates, right. Warren Buffett has donated $2 billion to the Bill and Melinda Gates Foundation, his investment company Berkshire Hathaway announced Monday. Buffett donated 17,458,431 in class B shares of Berkshire Hathaway (BRKB) stock, which was trading at $115 per share on Monday. The 82-year-old billionaire also donated 1,745,843 shares, worth $200 million, to the Susan Thompson Buffett Foundation, named for his late wife. He also donated 1,222,085 shares, worth $140 million, to each of three foundations: Howard G. Buffett, named for his son, as well as the NoVo and Sherwood foundations. Omaha-based Berkshire Hathaway said this was part of Buffett's pledge to make annual contributions to five charitable foundations. Berkshire Hathaway is an investment company with a wide range of interests, including freight rail, finance, manufacturing, retail, services, insurance, newspapers and Dairy Queen. The Gates Foundation, named for the co-founder of Microsoft (MSFT) and his wife, also has a wide range of interests, with a focus on alleviating global poverty. One of the foundation's more well-known projects is reducing malaria through the distribution of insecticide-treated mosquito nets.